Kissinger emphasized that the Russia-Ukraine stand-off could not be simply confined to an analysis of rivalry between two states. 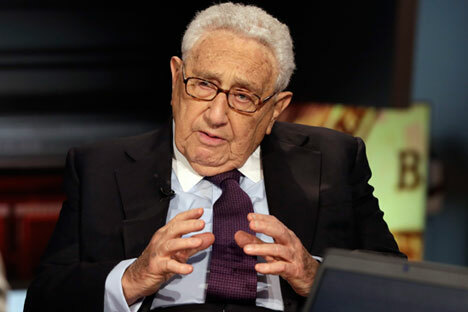 In a recent interview, former US Secretary of State Henry Kissinger suggested the possibility of reconciling the different positions of those involved in the crisis in Ukraine, raising hopes that a resolution could be brokered peacefully. A recent interview of former US Secretary State Henry Kissinger raised hopes for reconciliation of different positions of parties to the Ukrainian conflict. The veteran diplomat, known for his astute diplomacy during the Cold War and for being an architect of détente and US-China relations, suggested that the US and Russia should explore prospects of cooperation on the conflict. The conflict has evoked memories of the intense rivalry of the Cold War, and scholars like Noam Chomsky have even gone to the extent of predicting a nuclear war if the escalation continued. Kissinger emphasized that the Russia-Ukraine stand-off could not be simply confined to an analysis of rivalry between two states. It is not just a conflict over territory or resources and, as Kissinger argued, Ukraine has a special significance for Russia from a cultural and historical perspective. According to him, “The relationship between Ukraine and Russia will always have a special character in the Russian mind… It can never be limited to a relationship of two traditional sovereign states, not from the Russian point of view, maybe not even from Ukraine’s”. He implied that the conflict was much more delicate and pertains to deeper issues of identity, ethnicity, culture and history. These elements cannot be delinked while focusing on the conflict. Kissinger spoke of the prospects of military conflagration in Ukraine, and argued that the conflict is not amenable to resolution by force. Despite the signing of many peace agreements, the violence has not gone down. The UN has estimated that more than 6,500 people have lost their lives since the beginning of the conflict. Kissinger also suggested the idea of a militarily non-aligned Ukraine. Russia has questioned the relevance of the military organization North Atlantic Treaty Organization (NATO) in the post-Cold War period and called it a ‘Cold War relic’. During the Cold War, when superpower rivalry was at its peak, NATO and Warsaw Pact provided a security umbrella to countries in rival blocs. While the Warsaw Pact ended with the end of the Cold War, NATO increased in size by including countries from the former Soviet space. Russian has expressed concern at NATO’s expansion towards its border. The transformation of Ukraine into a militarily non-aligned state, and consequently a buffer state, may reduce the tension in the region. One of Kissinger’s suggestions is that the US should consider recognizing Russia as a great power. He further suggested that, instead of breaking Russia, “the long-range purpose should be to integrate it.” Perhaps Kissinger was motivated more by pragmatism, than by ideology, in this suggestion. He argued that Russia-US relations have implications for the global order. Cooperation between the two powers would ensure global peace and stability. The world is plagued by many daunting challenges including the rise of the Islamic State, Syrian conflict, climate change, terrorism and extremism. The lack of coordination between the two powers has in no way helped in addressing these challenges. As a result, though the leaders and diplomats of both the countries have met on many occasions to address these issues, there has been no significant outcome. India, a traditional partner of Russia, has adopted a pragmatic approach towards the conflict. When the conflict erupted in February 2014, with violence at the Maidan and the forcible ouster of Yanukovich, and the subsequent separation of Crimea, Indian diplomats reiterated that Russia has ‘legitimate’ interests in the region. The Indian leadership has maintained a balanced position, so as not to displease its traditional partner, and not be seen as anti-West. When Sergey Aksyonov, a Crimean leader, accompanied the Russian President on his visit to India last December, New Delhi downplayed criticism of the visit. Some Indian businessmen expressed interest in doing business with Crimea. Attempts by US diplomats to pressure India to support US policy did not work well. India abstained from a UN vote on Ukraine that was perceived to be against Russian interests. India’s position on Ukraine remains that the conflict needs to be depoliticized and demilitarized; and it needs to be resolved through dialogue between the parties. Though Indian President Pranab Mukherjee greeted his Ukrainian counterpart on the country’s Independence day this week, this is a normal diplomatic courtesy.